Last year, after we first arrived in the PNW, we thought we knew how to prepare for storms. You know, make sure the dog is inside, close the windows, get the shoes and jackets out of the yard, make sure the car windows are shut all the way. The basics, but mostly for outside the house. However, a year of losing power to the house, along with losing power to our well, changed how we viewed the inside of our home. Like, the IKEA tea candles we’ve been using for the past 20 years to get by when it’s dark? Yeah. Those can’t illuminate through the black of night out here. They also don’t last very long, so we upgraded to plumbers candles. These babies will last for hours and hours, and fit very nicely in mason jars. Water? Yeah, since the well is electrically pumped, that means if the power goes out the water goes out. That impacts making coffee, doing laundry, doing dishes…and flushing toilets. So gallons and gallons of water are now stored in our garage. The recommended “72 hours of emergency water” is covered, probably threefold at this point. Fortunately, our stove is propane so we can still cook, which is helpful. But with 5 kids and no Wii or computers for days at a time, you need to be prepared for boredom…no, you need to be prepared for boredom. Because once that sets in, everyone is miserable. So I filled a red chest I found at a garage sale with board games, cards, drawing supplies, toy dinosaurs, and whatever else I’ve found here and there. The nice thing about the chest is that it isn’t the kids’ normal toys: these only come out during Shabbat or power outages, so they aren’t overused and the kids still want to play with them. Plus, since it gets so dark out here there is also flashlight hide and go seek, which is always a winner. ANYWAY, we have been totally prepared for this #Stormpocalypse typhoon that was supposed to start hitting us last night. We cleaned the house so we wouldn’t trip over anything in the dark, we got our flashlights out, I put a flashlight in my bathrobe pocket just to be super ready. I made sure my phone and laptop were totally charged, and we ground all our coffee beans so we wouldn’t have to find the one cafe on the island that actually had a generator running, we made a grocery run the night before…and we were ready!! AND THEN IT NEVER CAME. And it just never happened!! We had a rainy night, but that was about it. Even now, the windstorm is supposed to be upon us like white on rice…and it’s just kinda breezy and overcast. And the #Stormpocalypse that was supposed to land on us this weekend? The “storm that you tell your grandkids about”? No plumbers candles?? No power outages?? No fetching water out of the garage to make pour-over coffees?? No getting board games out of the red chest, because the kids are happily plugging away at their work on the computers?? Well. I guess we’ll survive. The history of dying fabric goes way, way back. But the history of tie dye is still pretty recent. Sometimes, we take our childhood for granted. We certainly don’t appreciate the freedom of climbing trees in our youth as much as we do when we are adults. We also didn’t appreciate health insurance for broken bones as much, either. When I was growing up, we were always outside. Granted, I lived on concrete in the middle of LosAngeles, but we were still outside! Chasing bugs, digging up my neighbors tulip bulbs (Sorry Vivian), swimming…and tie dye parties. I honestly thought everyone had tie dye parties when they were growing up. They were just a part of life. I am finding a lot of my friends have never had a tie dye party. I don’t even know what to say. Other than the fact that I am now having tie dye parties… mostly with their kids. My friends won’t wear tie dye shirts. You don’t need a lot for a tie dye party, but the things you do need are pretty crucial. The soda pre-wash is crucial for getting the colors nice and vibrant. Latex gloves are BEYOND CRUCIAL unless you want tie dye’d hands for the next few weeks. I really need to see how something is done before I understand how it works. Call me “visual” call me “right-brained.” Call me incredibly resourceful, because I know where all the visual demonstrations are, at this point. Not everyone wants a gigantic swirly on their chest. Some people would like a heart, or a star! There are some neat patterns in here that will break the norm of tie dye habits. All righty, my fellow hippie friends. Not interested in paying The Man for pre-made, commercialized dyes filled with chemicals and alien technology? Try vegetable dyes…use the purple from boiled beets, or vibrant yellows from organic cayenne! Trust me, this will be a gentle experience for your sweet, hippie soul. Okay, Bonus Round: Try using a brush with the dyes, instead of rubber bands. I KNOW, RIGHT??!! So, we have had a good first week! We’ve slept on the kitchen table, we’ve explored the driveway a little, we’ve met the cat (who is still fine with him, which is weird). He’s had a bath, and I have before and after pictures of what he looks like all fluffy…and soaking wet (seriously, where is his body). It snuck up on me, as most gluten tends to do, and I just realized that it was National Noodle Day. Unfortunately, I can’t find a darn thing to support this momentous day. There isn’t, like, a proclamation by FDR saying how important noodles are to the American public, or the Queen of England insisting we respect the noodle for a very British reason, thus creating National Noodle Day. The problem I have with this food day is my body’s insistence on having Celiac. But, what’re ya gonna do. Find edible gluten free noodles, that’s what you’re gonna do. Celiac is a challenge, in itself. It typically takes a person about 5-10 years of debilitating symptoms, and countless sleepless nights being convinced you are dying from cancer of everything before they find out they have Celiac. And once you eliminate a wide range of glutens from your diet, you feel so much better. No more breathless dinners, no more vigorous pains in your guts, no more fuzzy thinking…and no more sleepless nights worrying about cancer. The only thing you have to worry about now is navigating through the dubious minefield of gluten free products. Fortunately, we have come a long way since then. We finally have noodles that will hold their shape even 1 hour after cooking them! So, what better way to celebrate the gluten free journey than by joining in on this momentous National Noodle Day! 1) Boil Your Gluten Free Noodles! Keep an eye on them for 8-9 minutes. These noodles can be tricky. 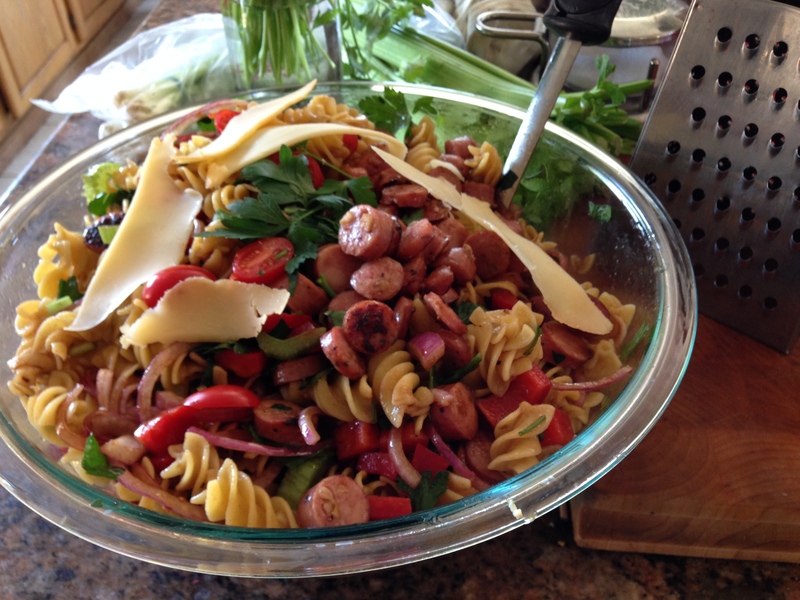 Don’t under-cook, but for heavens sake…don’t over-cook! They should be rather easy to cut with the edge of a spoon. and they’re easier to fork than penne. First take your red onions and put them in the bowl with the parsley and grape tomatoes. Add a pinch of kosher salt and a fat grind of pepper, and then a few dashes of balsamic vinegar and olive oil. Let these puppies marinate while you’re prepping the rest of the veg. Slice the celery and bell pepper and set aside. I usually find Applegate Chicken Apple sausage because it is kosher…my preference. Stir the bell pepper and celery into the marinated tomatoes and red onion. 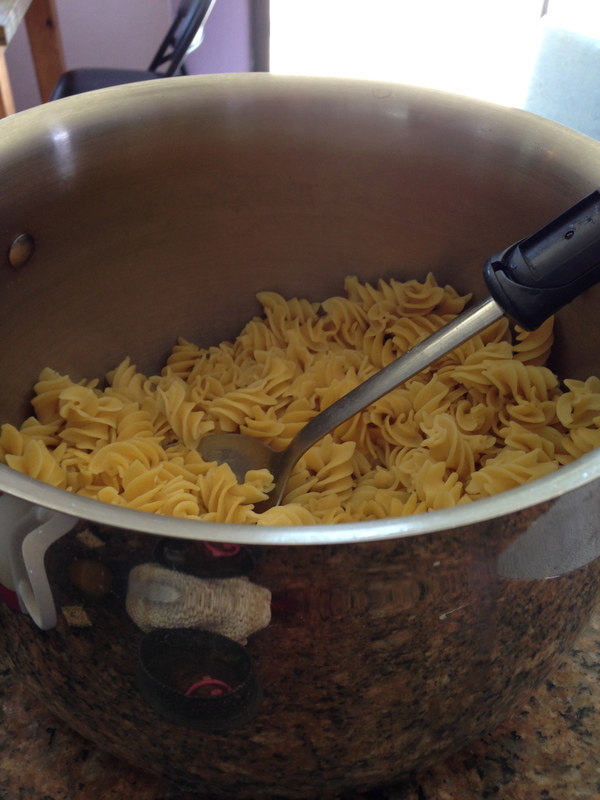 Then lightly stir the noodles into the bowl with a large spoon, but be careful not to break the noodles. Add more olive oil and balsamic vinegar, with a few pinches of kosher salt, ground pepper and a few dashes of basil. 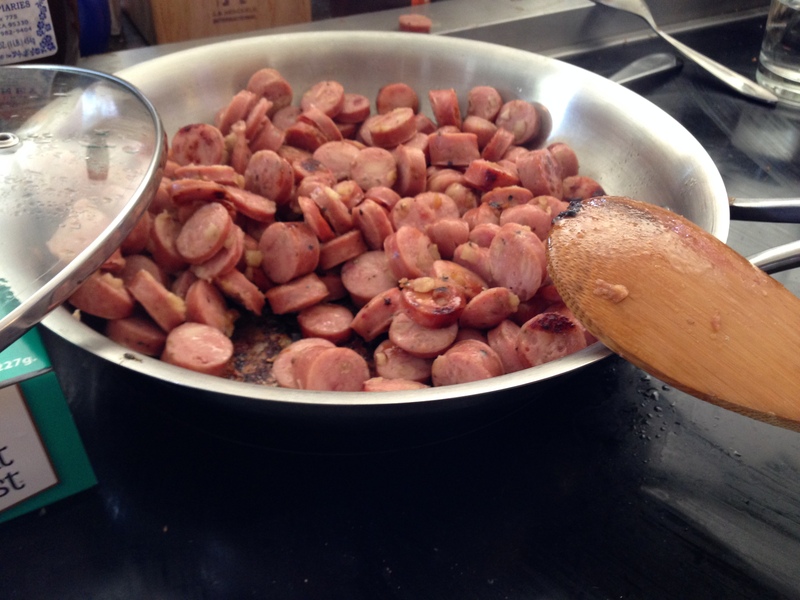 Finally, spoon in the cooled sausage. I also added some sliced parmesan on top for some added zest.